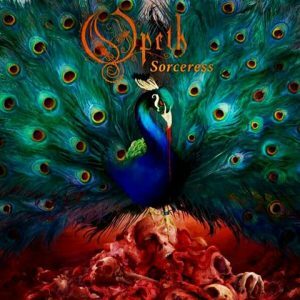 Review: Opeth – Sorceress – Nuclear Blast Records – Release: Out Now. By now the cries for a more death metal oriented sound should have faded to background noise as Opeth released their third prog rock/metal oriented album. Yet, after the album opens up with the very serene ‘Persephone’ you almost think you’re back in older times with the heavy sounding title track! While its opening is very bass and synth/guitar focused the song quickly slows down to a heavy romp which only lacks heavy distortion to count as a death/doom metal track. Don’t get your hopes up though, as Mikael still sings without any harsh vocals. The title track is also by far the heaviest song on the album as it is once again a very prog rock based album, albeit with a very occult mood. Follower ‘The Wilde Flowers’ continues as a great sort-of acoustic classic Opeth song. ‘Will O the Wisp’ still outstrips them all as the first bit of tranquillity on the album with a song that just sort of softly flows on with a dreamy guitar solo at the end. ‘Chrysalis’ brings back the heaviness and even sparks a fire with a terrific guitar & Hammond organ solo, before slowly drifting away in an enchanting ending. This enchantment lasts for two full songs with a second part of the title track and the Eastern melodies infused ‘The Seventh Sojourn’ providing a nice nod back to older Opeth albums. ‘Strange Brew’ will probably be a treat to hear live as this song really sounds like classic Opeth, albeit a bit softer. It’s great to hear the full melodies this way, but it would be terrific to hear it played live with some extra muscle. ‘A Fleeting Glance’ opens with some nice medieval strings before going fast forward to the 70s with warm keys and bass guitar and a catchy as hell guitar solo, after which it easily slips into the penultimate song ‘Era’ which is nicely up tempo and reminds me a lot of the “Heritage” album. And while there is a closing track, this one is definitely the real way to end this album with. Even if the overall sound is a lot softer, there is no denying that “Sorceress” really is Opeth through and through.